According to Mel’s All New Square Foot Gardening book, peas should be planted 5 weeks before the last frost date. A friend of mine heard you could plant anytime after President’s day (end of February). However, the reference sheet for growing peas (from the Utah State Extension) says to plant as soon as soil temperatures reach 40 degrees. Since I don’t have a thermometer for my soil, and I had NO IDEA when this would be, I called my local extension office (that’s what I love about the state extension–free advice!). They said: “As soon as you can work the soil.” With raised garden beds and Mel’s Mix, it is easy to work the soil as long as the snow is melted! My group is GREEN, and is on week -9. I wasn’t planning to plant my peas for 4 more weeks, but I am excited to get started now. I am going to update the newsletters and charts to reflect this new information, but I wanted any feedback about when to start peas in your area. I was thinking week -9 to week -5. Does this seem too early or late to any of you? I am guessing either 9 or 16 per square. The way to tell–look on the back of the seed packet under plant spacing. If it directs you to plant them 1-3″ apart, then do 16 per square. 4″ apart, then 9 per square. 6″ apart is 4 per square, and 12″ is one per square. My peas say to plant 2″ apart, which would be 16 per square. I am going to plant bush peas. How many do I plant in each square? The same is true for some of my peas–one packet says I need support, the other doesn’t. I would trellis both of them, just to be safe. My neighbor said she grows peas that don’t need support, but I think that variety would be identified as bush peas. 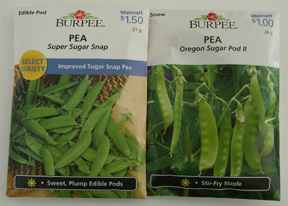 I bought the same kind of pea seeds as you did…we love snow peas and snap peas. My question is, the back of the sugar pod says they are vining, but the sugar snap does not. Do you trellis the sugar snap peas? I think you can still do two rows of 4, just guide them over to the trellis, or tie them to it when they are tall enough. Great suggestion. Do you have any suggestions for trellis-ing the peas if I can’t move my trellis or box over? Do I only plant four plants then, those that can be close to the trellis? Thanks so much for your help!! I plant mine in two rows of 4 with the trellis between the rows. That way both rows of peas can use the trellis. 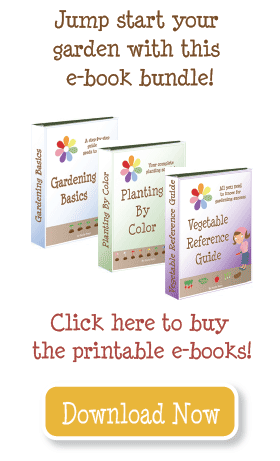 I have a question about peas and trellis planting… I see from Mel’s book that I can plant 8 pea plants in one square. Do I space them equally throughout the square… and if so, how do you trellis all 8 plants, especially when some are as much as 9 inches away from the trellis? Thanks for your help. The official word on when to plant peas is “when soil temperatures reach 40 degrees” and “as soon as you can work the soil,” meaning–as soon as the ground is not frozen. Other sources have said as early as 10 weeks before the frost date and as late as 5 weeks before the frost date. I would combine all that advice to say your peas should go in the ground between weeks -10 and -5, as soon as the ground is not frozen and you are able to plant them. I’m in the “blue group”. I live in Sudbury, Ontario, Canada. This morning I woke up, checked my e-mail and found the latest reminder. It says I can plant peas today. Um, well, we still have snow. Will I be too late if I wait for the snow to go? Should I start them indoors after all? Every garden I plant fails, so you are my only hope. Please help me figure this out. Hi, I love your site! I have been doing SFG for 3 years and I love it! I live in the Boise area, and here we plant peas around St. Patrick’s Day. What a lovely site! Thank you for al your work here.. I am learning SO much! I hope to plant some lavender this year for my handmade soap, and a SQ ft garden may be the way to go! Peas can be planted really early. I too am in the green group and my mom has been telling me that they can be planted now. I just need to get out there and do it. Sounds just right! I got a planting list from Anderson’s Seed and Garden here in Logan and they said that you can plant them when the soil is dry on top. Peas and Cabbages. Well, we got 24 inches of new snow a few days ago (south end of Hyrum), so it’ll be a while before I can plant my peas. They also have a list of when to start plants indoors, and then when to do your next planting, and then the next, all the way through the fall planting! Thanks for the tip on sterilizing old pots. I have been cleaning them well and then running them through my dishwasher on the SaniRinse mode to get ready for putting my tomatoes into those gallon pots. It’s worked like a charm. I couldn’t think of an easier way. If you have a tip, please share! On a side note: There is an old Indian legend of a planting bird on one of the mountains near Blacksmith Fork Canyon in Hyrum. As the snow melts, there is a place where everything else is melted but the little bit of snow left in a shadowy area on the mountain becomes the shape of a bird. I couldn’t believe it until I asked my husband about it and he said that as a kid their family would watch for the planting bird to plant their peas. My mother in law said she always got perfect peas. And then later we saw photos at the local museum about the planting bird (helps to see what to look for) and it said that there are other areas on the Wasatch front with the same sort of idea. It will probably be another month before we see it. I knew they needed to be planted early and I knew I was behind, but I went ahead and planted them last Saturday and I’m just crossing my fingers that some of them grow.